A selection of synthesised sound modules for model boats and rail. Suitable speakers are on a separate page. Both sound modules have 1 or more trigger inputs (horn, whistle, etc). This may be connected to the P output of a Deltang receiver via a 4k7 ohm resistor to limit the current when the P output is on (3.3 or 3.5V, depending on receiver). 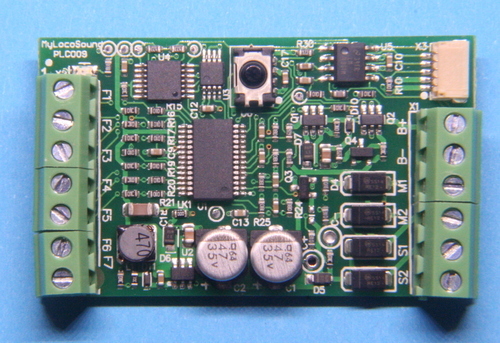 The sound card inputs are 5V when the trigger is open circuit (off) and lower resistor values will exceed the microprocessor's maximum over-voltage current. Configure the P output to be high when off and low (0V) when the sound is to be triggered. The Mtroniks digiSound modules are 100% waterproof, plug-n-play sound module designed to take the hassle out of giving your model a realistic sound. Primarily designed for R/C boats, the sounds are also appropriate for small diesel rail locomotives. 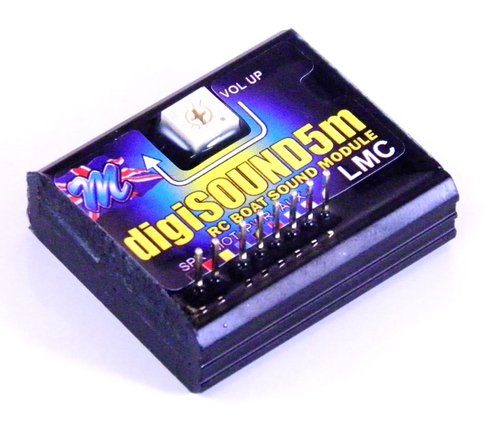 The sound module has an input voltage range of 6V - 12V and requires NO programming or set up. It comes with a realistic sound pre-installed leaving just the installation to complete before you can get under way. The unit comes complete with built in amplifier, wiring loom and a 80.0mm diameter waterproof speaker (83mm sq mounting plate). You simply install the unit in your model and go. The included speaker is dust and water proof so it is safe to use outside. You should always install your speaker into a suitable enclosure to ensure the best power handling, frequency and bass response. The sound volume can be adjusted using a small screwdriver. The instruction manual contains helpful information on installation and use. The module has inputs for start/stop of the engine sound and for sounding a horn - both of these are simple short-to-ground type inputs so can be easily switched using Deltang receiver 'P' outputs. Dimensions: 40mm x 35mm x 15mm. The connectors are on the top of the module and this increases the height to approx 30mm with the supplied plug and wiring harness. The overall height can be reduced to approx 20mm by carefully bending the header pins on the module through 90°. The 80mm diameter speaker supplied with the sound module is too large for most railway scales, we have a selection of smaller speakers that can be used singly or in combination to fit the space available in a loco or trailing van/coach. A low cost sound module for the larger scale railways: O Gauge, SM32, Gauge 1 & 3 and G Scale. Highly adjustable to suit a wide variety of UK, European and USA locomotives. Now available with Narrow Gauge / Light Industrial Diesel sounds. To achieve great realism, MyLocoSound Universal uses a blend of recorded sounds from actual locos with the adjustability of synthesised sound. A handheld remote control is used to make all adjustments and to configure the sound module from outside the locomotive. This remote control is available separatley as only one is needed to work with any number of MyLocoSound modules. There are 3 versions of the sound module for steam, diesel and electric locos (sound samples coming soon). For steam, a load sensitive chuff is provided which chuffs hard when accelerating, softens when coasting and changes to an overrun sound when slowing down. This chuff can be triggered by the locomotive, if a chuff trigger is fitted, or can be synchronised to the motor so that the chuff timing is correct for the number of cylinders and the speed. Diesel soundcards offer both electric and mechanical transmissions with the engine sound also being load sensitive. Dimensions: 55mm x 32mm x 12mm. Working voltage: 9V - 24V, 24V is an absolute maximum. Full setup and usage information can be found in the PDF copy of the steam, diesel or light industrial diesel or electric instructions.